Poker food and carts just like the ones you see in the poker rooms around the world. Take the drinks off your poker table and place them this cart. The casters make it easy to roll to anywhere. We offer a variety of side tables or food carts for your game room. 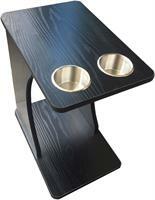 These are casino quality side carts perfect for placing drinks, food or snacks beside your poker table.